Briliant.It looks like a story of thousand nights and one night. The girl Arises as a dawn and your greatness does not overcome the greatness of the enchanted forest. Very good master piece. Sorceress.^. 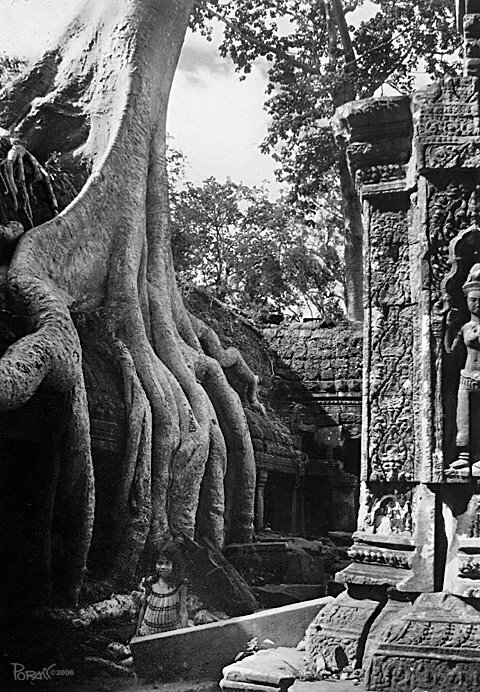 Oh man Cambodia is one place I wanted to go for sure.I still couldnt make it.Great photo.You have the colour one too. i was about to say the samething that backpack said... great composition mate. how you felt the place ? wow, long time!! havnt visited in awhile...this is s great shot, love the slight grain in it...the girl looks a lil spooky...as if she wasnt supposed to be there, but the film picked it up!! wow great new features you have here in your new layout. this picture seems kinda spooky. I love this, the way the tree draws the eye dow to the girl. Also, I would love to see Angkor Wat. Well done! She gave a great sense of scale to the tree's roots and the architecture around her. I like this shot! The roots looke like fingers creeping down to catch the un-suspecting girl. The little one was a surprise. Funny to discover her amid those massive shapes. I thought these ghostly figures come in movies only...Now they come in photographs tooo...hmm...The place is really spooky, I wouldn't want to be there although I love the photo. Very intriging shot. The perspective between the roots and the girl suggests a story in the making. The kid has given a superb sense of scale to this shot, well done! Great shot, this a place I'd love to visit, fantastic.